SouthFront: Analysis & Intelligence is continuing to study the balance of powers in the Indo-Asia-Pacific region. China has already contributed and is contributing many resources to the modernization of its Navy. 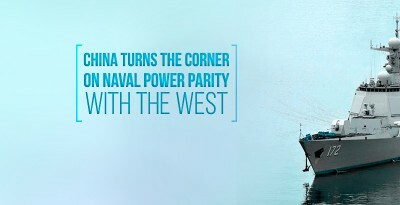 The growing Chinese naval power is the main reason of the US’s attention to the South China Sea and the whole American policy aimed to restrain the Chinese expansion in the region. In turn, without a powerful Navy, China won’t be able to continue pursue own geopolitical goals and defend crucial maritime routes. When most people think of a modern warship, they envision a sleek vessel with a stealthy superstructure, an advanced sensor and communications capability, a vertical launch system (VLS) and a balance of anti-submarine warfare (ASW) and anti-aircraft warfare (AAW) capabilities. The U.S. Arleigh Burke Class DDG is the poster boy of modern surface warfare ships. For many years, and arguably for many more to come, the Arleigh Burke Class DDG has been at the cutting edge of naval combatant design. It is; however, no longer alone. Many nations that have advanced naval capabilities took notice when the first Arleigh Burke Class DDG came in to service, and immediately set out to learn from its strengths and to avoid its weaknesses. A number of nations incorporated into the U.S. defense structure, set out to build similar platforms with the same combat management system and defensive and offensive capabilities. Nations that found themselves outside this defense structure, and often times the target of a robust and adversarial U.S. defense posture decided to go “back to the drawing board” and design a vessel that could not only incorporate the strengths of the Arleigh Burke Class, but one that could exceed them. They decided to design a better vessel. The Chinese People’s Liberation Army Navy (PLAN) was a force in need of modernization at this point. Chinese destroyers lacked the AAW capability to defend themselves beyond the range of land-based anti-aircraft missile batteries. With this in mind, China did not possess a “blue water” navy. In order to expand the effective range of its naval forces and to acquire the ability to project power farther out to sea, the PLAN needed modern warships that could both protect themselves and defeat an opponent. The Chinese government would embark on the most extensive naval modernization program in modern history, one that has seen the PLAN grow from an antiquated coastwise navy to a truly potent blue water force. The crowning achievement of this effort is the Type 052 (NATO designation: Luyang-III) Class DDG. The Type 052D Class DDG is the latest development in the Type 052 family of destroyers. The Type 052D was proceeded by the Type 052C and Type 052B Class destroyers, with the Type 052C being China’s first vessel to have true long range fleet air defense capability. The Type 052C used the same hull and propulsion systems as the Type 052B; however, the superstructure design was modernized and an active electronically scanned phased array radar was fitted coupled to a VLS equipped with 48 HQ-9 anti-aircraft missiles. This gave the vessel stand-alone AAW capabilities previously lacking in all other PLAN vessels. The ship also carried a complement of 8 anti-ship cruise missiles, carried in two 4 cell launchers. Rounding out her armaments, the Type 052C carries a 100mm deck gun, 2 x 30mm close-in defense guns and 6 x 324mm torpedo tubes in two triple launchers. The vessel has an aft hangar and flight deck for one helicopter for support, reconnaissance and long range ASW defense. The first Type 052C, Lanzhou DDG-170 was commissioned in September of 2005. 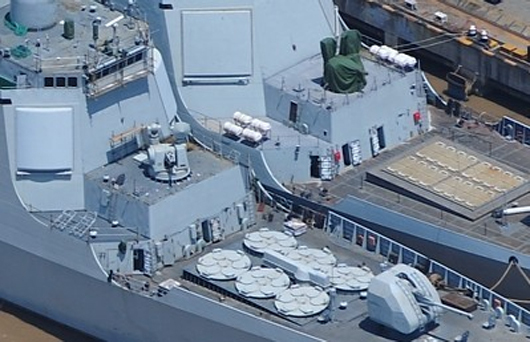 Type 052C picture illustrating convex radar array panels and round VLS 6 cell launchers. China continued to make rapid advancements in both missile technology, battle management systems and AESA multi-function phased array radars in the first decade of the 21st century, and a more powerful warship built on the Type 052C platform was designed. The new vessel was designated the Type 052D and would be equipped with more advanced detection and targeting systems and an ingenious modular VLS. This modular VLS sets the Type 052D apart from other DDGs in the navies of the world and is a true game changer for the PLAN. The Type 052D is a true blue water navy warship. It hull and propulsion provide good seaworthiness, maneuverability and speed. Her AESA radar has obviously been improved with the most advanced such radar that China has produced. The easiest way to tell is by contrasting the flat panel phased array radar antennae of the Type 052D with the convex panel of its predecessor the Type 052C. This denotes that the newer vessel most likely has an improved version of the Type 348 radar that is also liquid cooled, as opposed to original the air cooled version. It is surmised that this new radar may be able to detect and track stealthy aircraft such as the F-35A/B Lightning II, but at what effective range is unknown. The Type 052D has incorporated a brand new VLS system, which is also different from the Type052C VLS’s 6-missile cylinders. The new modular VLS is the most striking improvement of the new DDG. It is rectangular in design, with one 32 cell unit mounted forward of the superstructure and one 32 cell unit mounted aft. The VLS system resembles the U.S. Mk41 VLS, with no visible exhaust ports, which denotes that the system is either capable of cold launch, or the exhaust is vectored to a different location than its predecessor. Each VLS cell can house 4 missiles of different types. The VLS system is capable of launching surface-to-air missiles, anti-ship missiles, anti-ship cruise missiles including the YJ-18, anti-submarine missiles, and land attack cruise missiles. Such a system allows the Type 052D to be armed with a variety of missiles dependent upon the mission requirements. In theory, all VLS cells could be loaded with anti-ship missiles or anti-ship cruise missiles to create a powerful “Aircraft Carrier Strike Group Killer”. Such a load-out is imprudent, but possible. 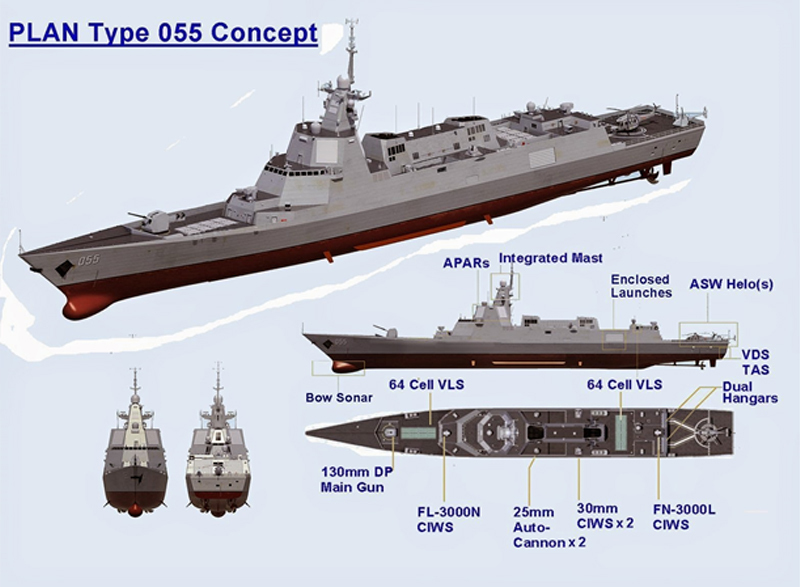 A more balanced armament would be most likely, and would be tailored to the mission, and with 12 vessels in the Type 052D Class planned, this represent a great deal of firepower. Detail of differing VLS and AESA radar arrays of Type 052C and 052D Class DDGs. The YJ-18 anti-ship cruise missile poses a significant threat to the U.S. Navy as well as any other potential adversary. It is believed that the missile has a subsonic cruising speed of roughly Mach 0.8 and then before striking its target it enters a terminal stage of supersonic speeds of up to Mach 3, which makes it extremely hard to intercept. The YJ-18 has an effective range of 290 nautical miles, with a theoretical threat area of 264,200 square nautical miles. This missile reportedly has an inertial guidance system fed by the BeiDuo Satellite System (BDS), often referred to as the Chinese GPS system. Displacement: approaching 7,000 tons fully loaded. L.O.A. : 156 m/ 511.8 ft.
Beam: 18 m/ 59 ft. Draft: 6.5 m/ 21.3 ft.
64 cell VLS armed with any combination of ASW, ASCM, LACM, and SAMs. 1 x H/PJ-38 130mm deck gun. Aviation: Hangar and flight deck for 1 helicopter. One of the more striking aspects of the Type 052D DDG program is the rate at which these surface warfare platforms have been constructed. Building of the first vessel the Kunming DDG-172, was commenced in 2012. Since then, a total of nine vessels have been built, with a tenth under construction. Three vessels are currently commissioned and operating with the PLAN’s South Sea Fleet. A total of twelve Type 052D DDGs are planned before resources and efforts are put into the larger 055 Type DDG. It is no coincidence that all three of the active Type 052Ds (Kunming DDG-172, Changsha DDG-173, and Hefei DDG-174) are assigned to the South Sea Fleet and are based at the PLAN fleet naval base on Hainan Island. This sends a clear message to other claimants to disputed South China Sea islands and waters that China has the power and intention of backing their claims with force if necessary. These vessels also act as a strong access/area denial tool with their capable AESA radars and powerful AAW and ASW capabilities. With these vessels, the PLAN can create a large air defense umbrella over Chinese military operations and building projects in the region. The PLAN has been working on a larger and more powerful vessel than the Type 052D DDG that they call the Type 055 DDG. Although called a destroyer, a design displacement of over 10,000 tons (some sources suggest a displacement as large as 14,000 tons) would put the vessel into the category of a guided missile cruiser (CG). The vessel would most likely be designed as a fleet command vessel and powerful air defense platform for a future aircraft carrier strike group. Although construction has not yet begun on such a vessel, a mock-up to test the layout of radar arrays and other sensors, communications and information processing systems has been built in Wuhan, China. The vessel would likely be armed with two 64 cell VLS fore and aft of the bridge, a large deck gun in a stealthy turret, as well as a full complement of ASW weapons and close-in defense systems. Missile complement for the 128 total VLS cells would be similar to the Type 052, with the possible addition of more capable cruise missiles not yet disclosed. There would be hangar space aft for two helicopters as well as a flight deck. China has steadily modernized its navy over the past two decades, with an obvious acceleration in both its capabilities and acquisition of vessels in recent years. The PLAN is now fielding vessels that are arguably on par with western navies, and have a decided advantage over all other regional navies with the exceptions of Japan and Australia. In this case; however, they are rapidly gaining a numerical superiority. The Type 052D guided missile destroyer is an extremely capable, modern surface warfare combatant that provides the PLAN with a strengthened and growing blue water capability. The PLAN will no longer be limited in its range of operations, dependent upon land-based air defense coverage. 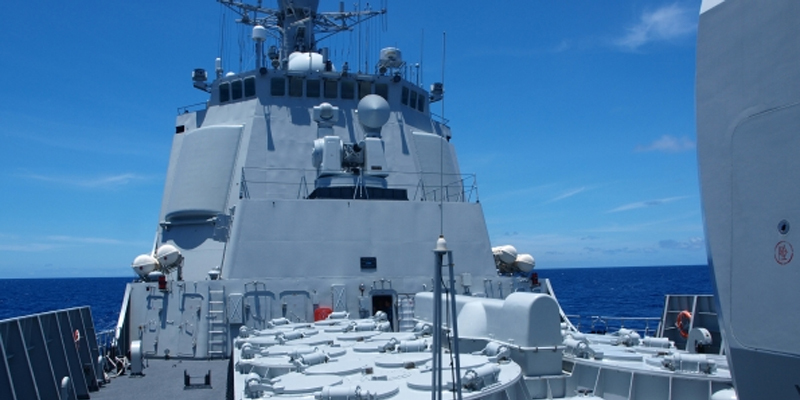 The Type 052D DDG can stand alone and defend itself from multiple threats. It is a great ASW and AAW platform for fleet defense and will be instrumental in development of a modern Chinese aircraft carrier battle group. With the acquisition of an aircraft carrier, and with a second currently being built, as well as three type 052D DDGs (of 12) and four Type 071 LPDS (of 6) China has built a formidable access/area denial capability to reinforce its claims in the South China Sea. It is important to note that China has gained this capability in just the past decade. Additional vessels of smaller displacement such as the Type 054A Class frigate and Type 056 Class corvette have also been built in large numbers in the same time period. As nations with conflicting claims in the South China Sea are faced with going into battle against a Chinese navy that has exponentially grown in size and capability, they may see military confrontation as exceedingly futile. A naval alliance of opposing claimants has been building in response, with Vietnam and the Philippines joining forces with non-claimant nations such as Indonesia, Australia and the United States. An added urgency has recently manifested itself in recent “freedom of navigation” operations on the part of this alliance, with both the U.S. and now Australia flying aircraft over Chinese island building projects in the Spratly Islands. Tensions are increasing with the U.S. sending the Arleigh Burke Class USS Lassen DDG-82 and a number of flights of aircraft, including B-52 strategic bombers within twelve miles of the islands. If China can avoid being drawn into a conflict early on, and gain the time required to establish its artificial island bases in the region and complete the commissioning of the modern naval vessels already being built, the nation will be at a distinct advantage. China has the resources, ingenuity and manpower to win a naval arms race with its neighbors. Chinese ability to control access to the South China Sea and effectively control this entire area is just a matter of time. Written by Brian Kalman for SouthFront: Analysis & Intelligence. Brian Kalman is a management professional in the marine transportation industry. He was an officer in the US Navy for eleven years. He currently resides and works in the Caribbean.